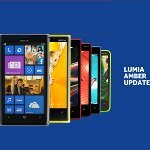 Good news for Indonesia, Today Friday, August 23rd 2013, The Nokia Lumia Amber update - software Update for Nokia Lumia with Windows Phone 8 are coming and available for Nokia Lumia 920 and Nokia Lumia 820 Indonesia. For Nokia Lumia 720, 620 and 520, The Nokia Lumia Amber update will be available soon. The update will reach all the Nokia Lumia with Windows Phone 8 by the end of September. It depends on your Region and Operator.